The Large Bin Divider was designed, copyrighted and manufactured by Penatube Ltd. The Large Bin Divider is used in numerous warehouses in Europe, Asia pacific and UAE. The Large Bin Divider has a Label Area of 18cm Long by 13cm Wide - thus enabling large and clear identification labels to be used for garment segmentation. The Code Area can have bar code labels on them together with other identification codes for ease of use by the operators. All of this is designed to make stock recording and garment division an easier task to manage within a complex environment. IForce the warehouse logistics company for John Lewis approached us to design a Rail Disk Seperator. The object of the Disk Seperator was to act as a Bin Divider for their garments on hanging rails within the warehouse. Mother Hooks are products used extensively in warehousing throughout the uk. 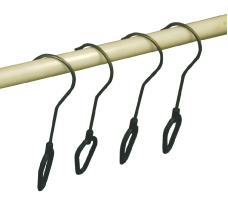 These MotherHooks are used by warehouse operators such as DHL Excel within their logistics groups. The Mother Hooks enable greater density of packaging to be obtained by hooking additional items onto the MotherHook. Penatube designs and manufactures an exstensive range of Plastic Gears, Plastic Pulleys, Plastic Chains, Clearbox Motors and Plastic Tubing all focussed on Design & Technology (KS2, KS3, KS4) in the educational market. The plastic gears, plastic pulleys, plastic chains, plastic racks and plastic tubing are listed on our Toys For Teaching website at www.toysforteaching.co.uk. For bulk orders from the Toys for Teaching website contact penatube by e-mail. The Bin Divider was designed, copyrighted and manufactured by Penatube Ltd. 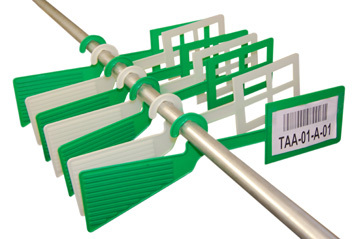 The Bin Divider enables bar code labels to be fixed to the product such that they are visible past the garment. Thus enabling stock recording and garment division an easier task to manage.